The Inksupply.com R1900 CFS offers a unique ink set which is reminiscent of the R1800 with its Red and Gloss Optimizer, however this is where the similarities end. The InkSupply R1900 CFS coupled with our Hi Gloss 2 compatible inks is a completely new formulation that offers a new Orange position that works with the Red to offer the most accurate skin tones. As to be expected with the Inksupply compatible inks, there is no profiling necessary to produce high quality prints. Our system is also produced in house at our Michigan facility so we can hold the quality of each CFS produced to the highest standards. The R1900 CFS system also uses both Matte and Photo Black cartridges this will allow the user to switch freely between glossy and matte papers without the hassle of purging the inks. 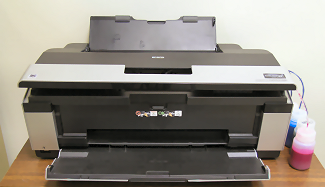 This is a great feature when you need a printer that can produce up to a 13" x 44" print on the fly without fooling around with multiple settings and cartridge types.